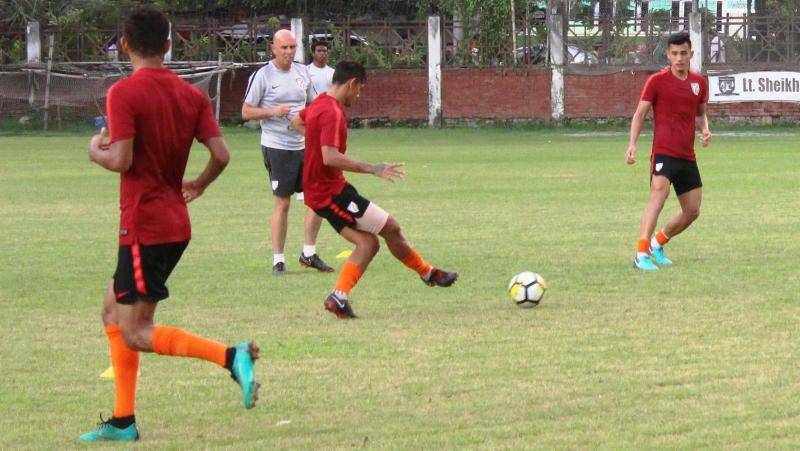 Defending champions India will start as overwhelming favourites coming fresh from a more-than-a-month (since July 28, 2018) long preparation camp look extremely focused and confident before embarking on their journey in the SAFF Suzuki Cup. The defending champions begin their campaign against the Sri Lankans at the Bangabandhu National Stadium in Dhaka on Wednesday (September 5, 2018). “We’re coming from a very effective camp in Australia. As we have spoken before we had three very different sorts of game and our boys have worked very hard to make a point there,” Head Coach Stephen Constantine stated. “Facing some of the good sides in this tournament would be a real challenge for us and this is the best scenario to test ourselves,” he added. The 20-member squad declared by Constantine is essentially a U-23 one with the exception of striker Sumeet Passi. “Apart from Sunil (Chhetri), Jeje (Lalpekhlua) and Balwant (Singh), there are not many out-and-out strikers in India. Then comes Farukh, Manvir, Passi who have minimal international experiences so far. We need more Indian strikers and these boys have shown their potential. Regarding Passi, he’ll have as much chance as anyone else to get into the AFC Asian Cup squad,” Constantine informed. India, who are currently ranked 96 in the latest FIFA rankings have been on the winning side 15 times against their neighbours out of the 22 face-offs so far. Meanwhile, the Islanders’ noteworthy victory against India came in the final of 1995 SAFF Championship which was then named as South Asian Gold Cup. Meanwhile, Nizam Packeer Ali, the newly-appointed Sri Lanka coach who faced a mighty Indian Team back in 1979 for the Olympics qualifier, felt the “better team” will have an edge on the ground. “There are no favourites once the match kicks-off and the better team will win eventually. It’s very crucial to start the campaign with a positive result and we’re up for it,” he added. “It’s better to face India early in such a tournament rather facing them in the knock-out stage.”Notably, Sri Lanka could garner a 1-1 draw against Constantine coached India in their final round-robin fixture of the 2003 SAFF Championship, which happened to be the first edition of the SAFF Championship staged in Bangladesh. The match is scheduled to kick-off is at IST 6.30pm and will be telecast live on D Sport. GOALKEEPERS: Vishal Kaith, Kamaljit Singh, Sukhdev Patil. DEFENDERS: Davinder Singh, Salam Ranjan Singh, Sarthak Golui, Subhasish Bose, Mohd. Sajid Dhot, Jerry Lalrinzuala. MIDFIELDERS: Nikhil Poojary, Vinit Rai, Germanpreet Singh, Anirudh Thapa, Lallianzuala Chhangte, Ashique Kuruniyan, Vignesh D.
FORWARDS: Sumit Passi, Hitesh Sharma, Manvir Singh, Farukh Choudhary.